Stars do shine giving us light to guide and inspire but what if that bright light all of the sudden vanish? 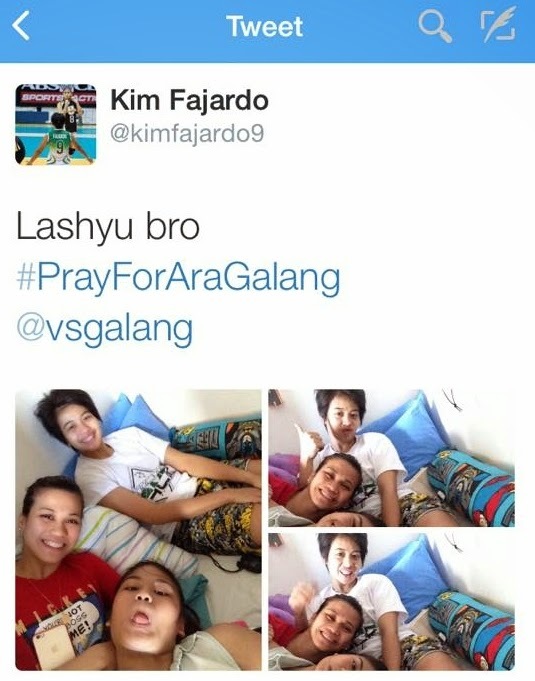 That was what we felt last Saturday (March 07, 2015) when De la Salle’s star player, Ara Galang suffered a very painful blow after an ugly landing from a hit to their opponent resulting in major injuries in her left knee which were then specified as MCL Tear, ACL Tear, Big Bone Bruise and Medial Meniscal Tear as the article on ABS-CBN sports website posted. It was indeed very painful for all when they saw the Queen Spiker on the floor crying hard with grimace as her pain level was reported as 10/10 which is the maximum. Ara doing her show with a big smile and energy. The heavens were in favour of the green girls as they were dominating the sets (26-24, 21-25, 25-18, 25-21) versus National University Lady Bulldogs that beat them on their first game of the twice-to-beat stepladder format that would decide what team will compete with Ateneo in the finals. The incident happened in the fourth set in the middle of her intense energy and ruling the court with her A-Game. Ara was rushed immediately to the dugout and the worried Lady Spikers continued with Justine Tiu who replaced her finished the game making them qualified for the Finals for eight straight years. The volleyball community as well as their fans were in shock and disbelief of what had happened to this very promising athlete. A mix of heartbreak and concern was all that we felt as they lifted her on a stretcher crying in severe pain. The social media was flooded with tweets and posts hoping and praying for her recovery as well as hard feelings of sadness and disbelief of what she went through. Those sweet smiles and powerful spikes she gave showed how she wanted her team to win, to inspire her teammates and show the world that she can lift her team as a captain. She gave all her best in it. 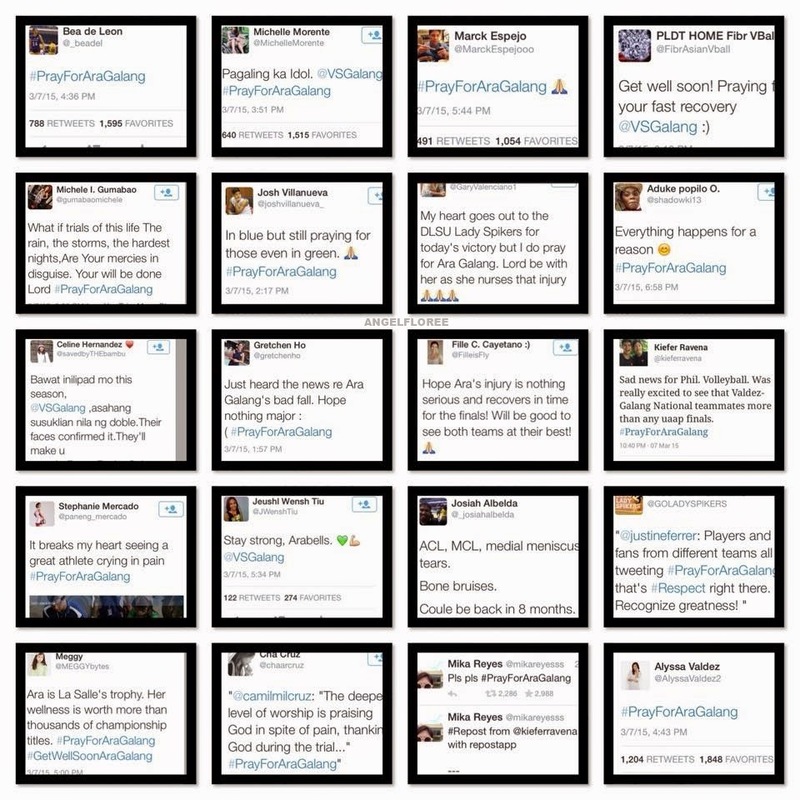 What overwhelming was that the hashtag #PrayForAraGalang trended for a day and a half on Twitter being twitted by big names in the Philippine Volleyball nowadays, no rivalries and competitions. All for Ara. All those posts in social media prove that she is a very good and inspiring athlete by touching all of our hearts on that evening. 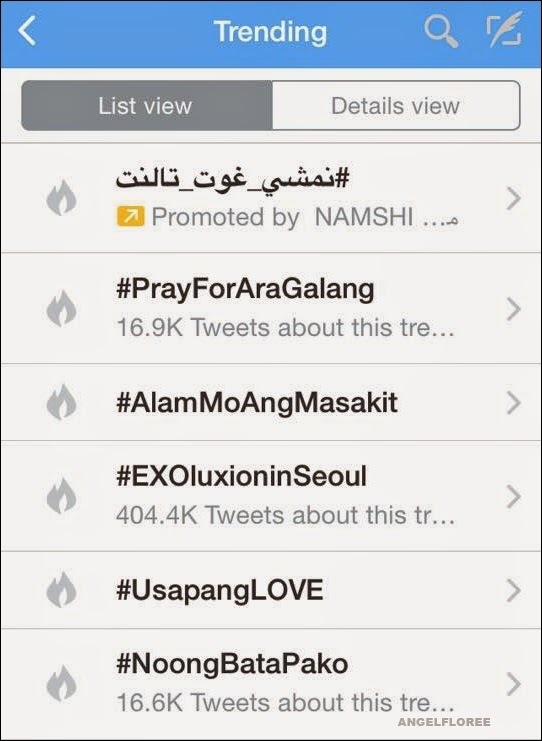 Ara trended on Twitter for almost a day and a half. But there was a sad reality all of us who support and admire her would have to face – her season 77 is now ended and will not be able to play in the finals anymore due to the severity of her injuries. Reading those updates added more to the heartbreak, the Aramazing passionate and very promising spiker was out. They said that the estimated healing time is 8 months, that means that there is no possibly for her to play in U-23, SEA Games and still uncertain for Season 78. We all know that she worked and trained in all her best just to give her team championship redemption this season. She is truly a sports superhero by all respects. Earlier, Ara posted on her Instagram account that she still believes in her team and will be with them spiritually also thanking those people who are encouraging and motivating her. I love how she is handling things in her condition today by praising God and feeling so blessed for the love and care she receives from everybody. Resting well with her partner and good friends. 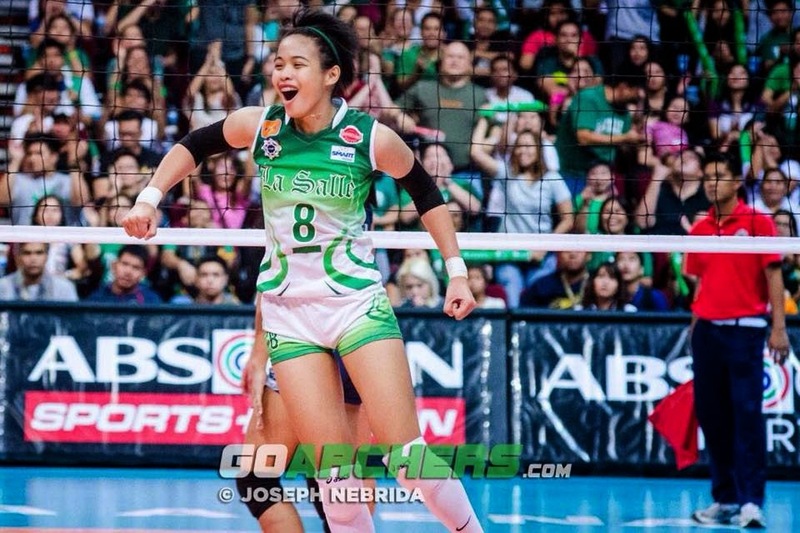 We love and support you for always Ara.